Unless we do not live on the same planet, I suspect you are aware of the Titanic. This amazingly luxurious cruise ship, la crème de la crème of her time, thought to be “unsinkable”, [spoiler alert] sank on 15 April 1912 after colliding with an iceberg in the North Atlantic. More than 1500 people died as among other issues the ship was not carrying enough lifeboats, which resulted in the creation of SOLAS, the international body that now regulates safety at sea. But why did the Titanic sink? Or more precisely, how did the iceberg manage to open such a large hole through her hull? The leading hypothesis in the 1990s (after the first explorations of the wreck) was that the steel from which she was built was not adapted to icy cold waters. The resistance of material changes with temperature, and although that steel was fine to navigate in mild English waters, it was too brittle at low water temperatures. In fact, although Titanic’s steel is brittle by today’s standards, it was probably not the main culprit. Instead, it seems that Titanic was assembled with low-quality rivets by unskilled workmen. 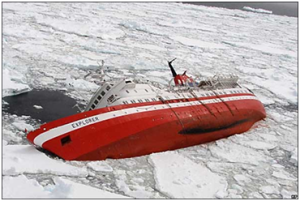 The impact with the iceberg lead to some popping out, opening the hull wide, ready for submersion. If you want to know more about why the Titanic sank, I suggest you read this very good report. If you find this conclusion a bit disappointing (basically, she could have been hit by anything with the same result), have a look at this sinking a few years ago off Antarctica. Or brace yourself for the next story: ships destroyed by waves! The container ship MOL Comfort, slightly bent. What do you think of when you see a very long container ship broken exactly in its middle? Conspiracy theory fans will tell you that it received a Russian torpedo (here). The official report will say that they still have no idea of what happened. My fluid mechanics teachers will point out it is surprising it does not happen more often on beam-like ships, relatively long and narrow (the MOL Comfort from the picture was 316 x 45.5 m). 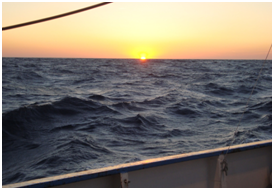 You can define your sea state using two main measures: the height of the waves (amplitude), and the distance between two consecutive waves (wavelength). The higher your waves, the more painful for the ship, hence the danger of the gigantic waves (observed recently onboard the Discovery, see here) and rogue waves. However, any wavelength can be dangerous if it is similar to the length of your ship. Basically, the more the ship looks like a beam (long and narrow) the more susceptible it is to torsion and flexion. These are deformations arising from a non-homogeneous stress on the structure. For a container ship or tanker, the stress is as represented below: bending down the ship in the middle when she sits on two highs at a time (a), then pushing her up in the middle when the ends are on the lows of the wave (b). Do that for a few hours of your crossing, and you can break a ship in half. I don’t want to go into too much detail, but there are other factors enhancing this issue. For a tanker, the movement of the liquid you carry (or sloshing) needs to be minimised. And of course, whatever you do, avoid resonance! “Capsizing”, “turtling”, “keeling over”… many names for the same effect: the ship turns upside down, fills with water very quickly, and unless you are very good both at swimming and orientating yourself (or very lucky) and can find a way out, you are very likely to die. 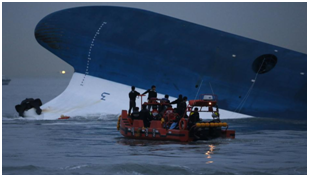 This is what happened a few months ago to the South Korean ferry MV Sewol; about 300 people died. It is still unclear what happened, but I read a few interesting accounts of a “redesign” of the ship. Here or here, they mention that some cabins had been added to the top decks. To understand why it is crucial, you need to know the basics of ship stability. Let’s call the ship’s centre of gravity G. There is also a centre of buoyancy B, which is the centre of volume of the water moved by the ship. For ship stability, the location of B is not as important as how it moves when you are rolling. 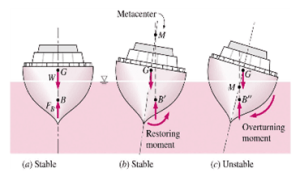 This movement more or less forms a circle whose centre is called the ”metacentre” M. The ship is stable while rolling if the metacentre M is above the centre of gravity G. Otherwise, it is likely to capsize. If you change the shape of the ship, or if you change either the total mass or its distribution, then you are modifying the relative locations of these three points. So if you take a ferry and increase its mass, by adding more at the top, it becomes unstable. If it is also subjected to very strong rolling because of a storm or typhoon passing by, it is unfortunately likely to capsize. Tagged Accidents, iceberg, Ship, Waves.